Flip-Flop sat on his favourite rock and looked into the sky. 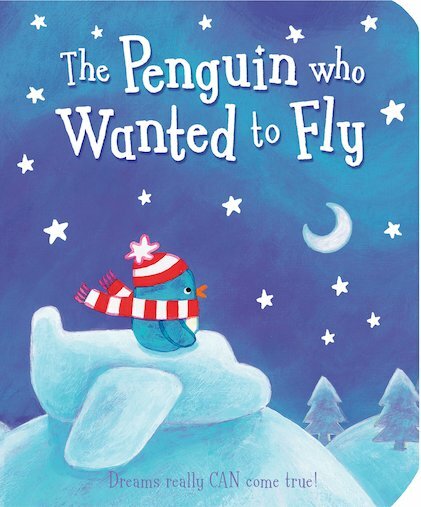 “I wish I could fly,” he said… All Flip-Flop the penguin wants is to soar far above the ground. But penguins are made to swim, not fly, and not even his snow aeroplane can help this baffled bird to make a graceful take-off. Is there a way to make his dream come true? Full of soft, luminous illustrations, this is a snowy story to cuddle up with again and again! Catherine Vase studied illustration at Brighton. Her first title for Scholastic, Milly and Friends Make a Sandcastle, was described as ‘A lovely story to share’ (The Scotsman). Another of Catherine’s titles for Scholastic is Milly and Friends Have Shopping To Do. Catherine lives in London.